Spring is PSSA time for public schools in Pennsylvania and the results for 2014 as reported in the Pittsburgh Business Times reveal exciting news for Unionville Chadds Ford School District (UCFSD). For those interested in this type of school district rankings, UCFSD now tops the state’s list, having ousted long-standing Upper St. Clair School District for the number one position based on 2014 PSSA results. The Upper St. Clair School District located in suburban Pittsburgh, had previously held the first place title for the last eight years but dropped to fourth in the rankings behind UCFSD, Mt. Lebanon (Allegheny County) and Radnor school districts for 2014. Although the 2014 rankings show Upper St. Clair School District dropping to fourth place, another Allegheny County school district, Mt. Lebanon holds at second place. This is the fourth consecutive year that I have tracked the top 15 school districts and the highlighted line in the chart below indicates that T/E School District has moved from second in 2011, third in 2012, fourth in 2013 and to fifth place in the 2014 PSSA rankings. Last year we saw UCFSD drop from second in 2012 to third in 2013. However, UCFSD turned it around for 2014 and ended up first in the rankings. Looking at other Main Line school districts, Radnor had dropped from fourth to sixth in 2013 but they also changed direction and are now third in the state. Great Valley School District jumped a couple of spots this year and for 2014, their PSSA scores have them ranked at 11th in the state. Looking at the ‘Top 15’ school districts in Pennsylvania (based on PSSA results), Allegheny County continues as the number one county with six school districts represented followed by Chester County with three school districts (Unionville Chadds Ford, Great Valley and T/E), Delaware County with three school districts (Radnor, Wallingford Swarthmore and Rose Tree Media) and Montgomery County with one school district (Lower Merion). A review of other area school districts indicates that Downingtown School District continues to improve; moving from 25th ranking in 2012 to 24th in 2013 and places at 22nd in 2014. Phoenixville School District moved up four positions this year from 98 in 2013 to 94 in 2014. A Pennsylvania school district that places in the top 15 or 20 out of 500 districts statewide based on the PSSA exams is an achievement for which students, parents, teachers and administrators can all be proud. Many view PSSA scores as a reliable predictor of future success. As a tool for student assessment, the PSSA exam helps measure and provides useful information of what students are learning. The PSSAs measure the performance of the entire class and provide of measurement of how an overall class is performing. Pennsylvania allows parents to exempt their children from standardized tests for religious reasons. 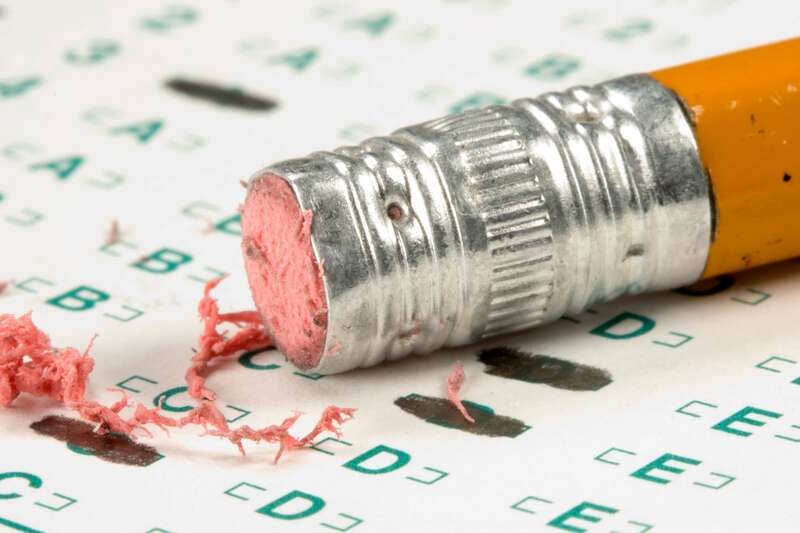 Some elected officials, including State Sen. Andy Dinniman, have been publicly wary of the way standardized tests are used. As Minority Chair of the Senate Education Committee, he offers ‘Eight Reasons Why We Oppose Keystone Graduation Exams’, believing that it is fundamentally wrong for three standardized tests to determine a student’s high school graduation. Beyond bragging rights for a school district or as a sales tool for local real estate agents, how important are these test results? Do children (and teachers) need this level of pressure to ‘measure up’? TESD ranks 4th in Pennsylvania for PSSA results but is it time to opt-out of standardized testing? Spring is PSSA time for public schools in Pennsylvania and the results are in for 2013. The Pittsburgh Business Times has published their 2013 Guide of Western Pennsylvania Schools, which lists the rankings of all school districts in Pennsylvania. The analysis of the school district performance is based on the Pennsylvania System of School Assessment (PSSA) Exam results. According to their website, the formula for the ranking takes into account three years of PSSA test scores in math, reading, writing and science. They look at three years of scores, with the current year given the most weight. The rankings do not denote the overall quality and performance of the school district, only the PSSA scores. In the ‘Top 15’ school districts category in Pennsylvania, Allegheny County was the number one county with six school districts represented followed by Chester County with three school districts (Unionville-Chadds Ford, T/E and Great Valley), Delaware County with three school districts (Radnor, Wallingford-Swarthmore and Rose Tree Media) and Montgomery County with one school district (Lower Merion). For 2013 rankings, Upper St. Clair School Districts holds onto its first place title for the ninth year in a row, with another Allegheny County school district, Mt. Lebanon moving into second place. This is the third year that I have tracked the top 15 school districts and in the chart below, you will note that Tredyffrin Easttown Township School District has dropped from its 2011 second place, to third place in 2012, to fourth place in 2013. The Unionville-Chadds Ford School District dropped their ranking from second in 2012 to third in 2013. Other main line school districts, Radnor Township School District dropped from fourth to sixth for 2013, Lower Merion dropped a level in rankings and Great Valley School District moved up from 14th to 13th place for 2013. Looking at other area school districts, Downingtown School District improved their rankings, from 25th to 24th and Phoenixville School District continues to drop in rankings, for 2o13 listed as 98th. A Pennsylvania school district that places in the top 15 or 20 out of 500 districts statewide based on the PSSA exams is an achievement for which students, parents, teachers and administrators can all be proud. PSSA scores is viewed by many as a reliable predictor of future success. As a tool for student assessment, the PSSA exam helps measure and provide useful information of what students are learning. The PSSAs measure the performance of the entire class and provide of measurement of how an overall class is performing. But how important are PSSA exams, beyond bragging rights of a school district. Do children (and teachers) need this level of pressure to ‘measure up’? Based on the varying socioeconomic advantages and disadvantages levels of school districts across the state, I don’t know how fair it is judge the work of entire school districts based on a series of standardized tests. Although evaluation is an important tool in learning, high-stakes tests, such as the PSSA exam, are being used to label students (as well as teachers and school districts). It is no wonder that there is rebellion among some parents not to allow their children to participate in the PSSA testing process. The grounds for the exemption are “religious” but the parents do not have to explain what their faith is, what about the testing is in violation of their faith, or anything else. According to the Pennsylvania Department of Education, if you believe that it is morally wrong to put your kids through the ordeal of a week of testing, that’s good enough. Timothy Slekar, head of the Department of Education, Penn State-Altoona and his wife decided to opt out of the PSSA exam for their son. Slekar included a copy of the letter in an article written for Huffington Post that can be used in Pennsylvania public schools by “people of most religious affiliations”. Slekar encourages readers “to copy, to cut, and to paste any or all portions of this letter for your own use in freeing a child from the pain of high-stakes standardized testing.” To read Slekar’s article and opt-out letter, click here. Is T/E School District the next Neshaminy? Today marks the first day for teachers striking in the Neshaminy School District. Over in Neshaminy, the teachers are starting the week on the picket line; also marking the second strike of the year. If you recall, in January the Neshaminy teachers were on strike for 8 days. The Neshaminy teachers and the school district have been locked in a vicious contract debate for 4 years with neither side willing to budge – sticking points in the bitter contract dispute is healthcare and salary. It is my understanding that the teachers want a 5% salary increase retroactively for the last 4 years. Additionally, the teachers healthcare package is completely funded by the taxpayers. The Neshaminy teachers have said that they will contribute to their healthcare costs going forward. However, it should be noted that I can find reference to the teacher’s offer to help with healthcare expenses but I am unable to find anything in writing to that effect. As I wrote in January of this year, the teachers in the Neshaminy School District are the highest paid in the state but if we look at PSSA results, the Neshaminy School District doesn’t even make the top 50 in the state, coming in at number 245 among Pennsylvania’s 500 districts. Over half of the Commonwealth’s school districts have outperformed Neshaminy on PSSA tests for the last 10 years. Compare that to Tredyffrin Easttown School District and the ranking of third in the state. If the highest paid teachers, working in a school district that underperforms 50% of all other school districts in the state, are willing to strike twice in 6 months … what does that mean for other districts with teacher contracts pending? Should the reward for the excellent education students receive in Tredyffrin Easttown School District be the threat to our teachers of demotion? Some readers have suggested on Community Matters, that the school district has nothing left as a contract negotiating tool but the threat of demotion and the increase in class size. The teacher’s contract is up in less than 30 days, June 30. As a community, are we prepared for a similar battleground as Neshaminy School District has experienced for the last 4 years? Isn’t there a better way? I used to think a teacher’s strike was not possible in T/E – my Pollyanna view of the world believed that both sides would somehow just ‘work it out’, agree on the contract and everyone would be happy. I no longer think that outcome is likely to happen. If, … the T/E school board decides to demote any of the seasoned, senior members of T/E teaching staff (for economic reasons), I truly believe that the road ahead may well lead to a District teachers strike. I don’t claim to have a crystal ball so here’s hoping that my hunch is wrong and that there is still hope for peaceful resolution in the days to come. US News Ranks Conestoga High School #3 in Pennsylvania, #279 Nationwide! Between the final tweaking of the District budget for 2012-13 and the continuing teacher contract negotiations, it is timely that the US News & World Report releases its list of the best high schools in America. The publication reviewed test data from 22,000 public high schools and 500 schools received the highest ‘gold’ level award. Conestoga High School received gold level standing, listing at a distinctive rank of 279 of all public high schools in the country. The US News results indicate an impressive #3 ranking for Conestoga for all public schools in Pennsylvania. There are 579 school districts in Pennsylvania and 752 high schools. As part of the state’s graduation requirement, PA high school students take assessments in reading, writing, math, and science in the 11th grade. US News Report uses the Pennsylvania Systems of School Assessment (PSSA) is used in the criteria for ranking the high schools. Conestoga scored 54.3 on the college readiness index, based on AP (Advanced Placement) participation rate. The AP participation rate at Conestoga is 56%. Results indicate 92% proficiency rate in reading. Results indicate 93% proficiency rate in math. Interesting to note that 2 of the top 10 public high schools in the state are located in Philadelphia! Locally, how did our neighboring high schools rank. Radnor High School made the top ten list in Pennsylvania at #6 and achieved a national rank of 432, qualify for gold level. Lower Merion High School received silver level nationwide, coming in at 835 and ranked #16 in the state. Great Valley High School was listed at the silver level nationwide, at 725 and #12 in the state. Phoenixville High School, another silver level, ranked 1,094 nationwide and #25 in Pennsylvania. Congratulations to Conestoga students, parents and teachers on this achievement! Last week, the Pittsburgh Business Times published their 2012 Guide of Western Pennsylvania Schools, which lists the school district rankings for the Pittsburgh area and the entire state of Pennsylvania. The newspaper analyzed all the school districts’ performance based on the Pennsylvania System of School Assessment (PSSA) Exam results. According to their website, the formula for the ranking takes into account three years of PSSA test scores in math, reading, writing and science. They look at three years of scores, with the current year given the most weight. In the Top 15 school districts category in Pennsylvania, Allegheny County was the number one county with six school districts represented followed by Chester County with three school districts (Unionville-Chadds Ford, T/E and Great Valley), Delaware County with two school districts (Radnor and Wallingford-Swarthmore) and Montgomery County with two school districts (Lower Merion and Lower Moreland). 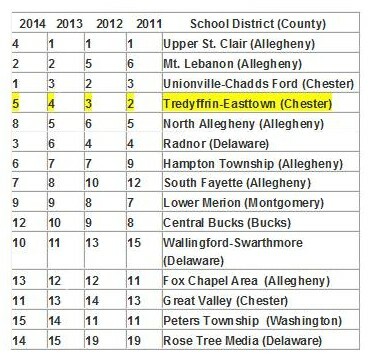 For 2012 rankings, Upper St. Clair School Districts holds onto its first place title for the eighth year in a row, with Tredyffrin Easttown Township School District dropping to third place and Unionville-Chadds Ford School District taking second place. Radnor Township School District stays in fourth place, Lower Merion drops down a level to eighth and Great Valley School District drops from 13th to 14th place. Looking at other area school district rankings, Downingtown School District moved from 28th to 25th and Phoenixville School District dropped from 85th place to 98th on the rankings list. To see the ranking for all 500 Pennsylvania school districts, click here. A Pennsylvania school district that places in the top 15 or 20 out of 500 districts statewide based on the PSSA exams is an achievement for which students, parents, teachers and administrators can all be proud. PSSA scores is viewed by many as a reliable predictor of future success. As a tool for student assessment, the PSSA exam helps measure and provide useful information of what students are learning. The PSSAs measure the performance of the entire class and give us the truest measure of how an overall class is performing. In the Unionville-Chadds Ford School District, the teachers union used their District’s high PSSA and SAT scores as a contract negotiating tool. I wrote a post on January 11, 2012, ‘Do Higher Teacher Salaries in Philadelphia Area School Districts Equate to Higher PSSA & SAT Scores?’ that included a report by Keith Knauss, a school board member from Unionville Chadds Ford School Board. Knauss looked at 61 Philadelphia area school districts for factors that might explain the wide variation in academic achievement on PSSA and SAT tests. While most of us might assume that the more experienced teachers, or those with the most education and the highest salaries would be factors associated with higher test results, Knauss research data does not support that theory, at least not in the 61 school districts in the Philadelphia area that he researched. Knauss concludes, “contrary to popular belief, there is no evidence from the 61 districts that spending or the number of teachers has a measurable effect on academic achievement.” Click here to read Keith’s Spending Trends Presentation TE research study. Bottom line … if we accept that school district rankings, based on PSSA performance, have an importance, do we give credit to the District teachers for the results? If you believe that the teachers play a role in the student’s performance on the PSSA exams, should the results be a factor in the current teacher contract negotiations? Should the TEEA use the PSSA exam results as a tool in their contract negotiations? TESD is facing tighter budgets and difficult choices are the options that remain for the school board. In all likelihood, the 2012-13 school year will see a $50 fee charged to students to play sports, perform in the marching band and participate in clubs. The District’s Education Committee is exploring many ways to reduce costs to help the budget. Last year we saw the elimination of foreign language in the elementary program and German and Latin in the middle school. Now we see that there is discussion of eliminating string lessons in the third grade or possibly eliminating elementary and middle school music lessons. Another couple of budget strategies in discussion — (1) the demotion of professional staff for economic reasons and (2) increasing class size to help the 2012-13 budget. Here’s a question — wonder if there is any research to suggest that increasing class size could result in lower PSSA exam results for TESD. Click here for details of Education Committee suggestions for 2012-13 budget strategies.